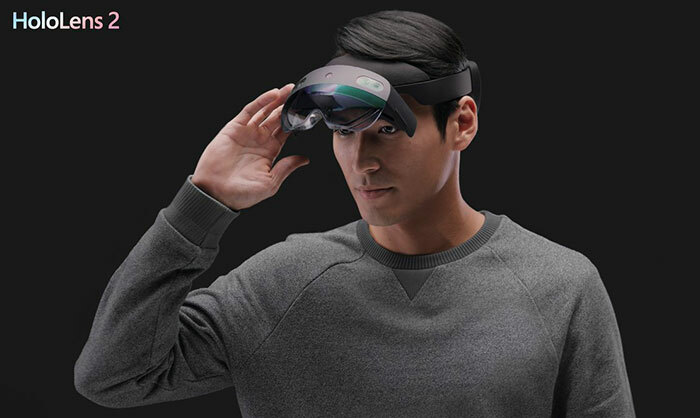 Microsoft has unveiled the HoloLens 2 headset at MWC 2019. It heralds the new mixed reality wearable as delivering "the most comfortable and immersive mixed reality experience available." In technical terms the major advancements over the original HoloLens come via an increase in resolutions from 720p to 1440p per eye and a "more than double" field of view (FOV). Furthermore, Microsoft has increased the comfort levels, included a depth sensor which enables hand tracking-interactions, leverages Azure AI smarts, and includes iris recognition to log different wearers of the headset into their account. The upgrades in resolution and FOV are important to users to deliver clearer text and objects in the MR environment and to increase immersion, especially important in training. The ergonomic 'floating' design is said to be very comfortable, important for people working with these headsets on 9-to-5 for example and runs untethered. Last but not least the other major upgrade - the depth sensor - allows people to instinctively "touch, grasp, and move holograms in ways that feel natural," thinks Microsoft. Eye tracking and voice recognition enhance the options available. Full tech specs are available here. If you watch the video above, or see clips from Microsoft's presentation, you will realise that Microsoft is aiming the HoloLens 2 squarely at organisations. In the video you will see engineers, medical professionals, and a theatre set designer all working with HoloLens 2. 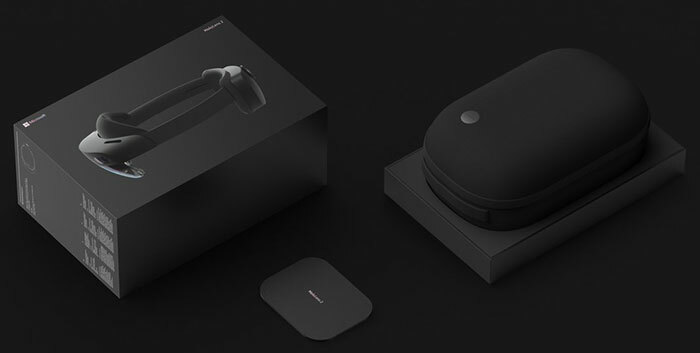 At the launch presentation Microsoft said it is already working with the likes of Airbus, Honeywell, Pearson and Saab on software to release with the headset. A more general office environment use was shown off, using an application called Spatial. This app presents a virtual whiteboard where multiple people can chat, share ideas, and so on - while seeing virtual representations of the other people. Other software highlights include the news that Unreal Engine 4 will support HoloLens 2, and Firefox is on the way to the platform too. The upgraded HoloLens 2 will be released later this year. An Enterprise Edition will cost $3,500 (£2,680), about a third less than the original version, and will become available in the US, Japan, China, Germany, Canada, the UK, Ireland, France, Australia and New Zealand. There are pre-order options available now. An Azure Kinect sensor is built into the HoloLens 2 but Microsoft has launched a new Kinect that looks at you and your surroundings, rather than aiding your vision and interaction. HEXUS has previously covered news stories about Kinect applications beyond Xbox gaming, and the new Azure Kinect DK makes the most of this segment with its professional features. Microsoft says that the new device includes advanced artificial intelligence (AI) sensors for sophisticated computer vision and speech models. Into its small frame Microsoft has crammed "a best-in-class depth sensor and spatial microphone array with a video camera and orientation sensor". Applications of the Azure Kinect are demonstrated in patient care, training, and shopping experiences. In the patient care example, the Azure Kinect can detect when a person has fallen out of bed, for example. The cloud powered Azure Kinect costs $399.